I want to share some important information with you. Don't be robbed of God's plan and blessing for you, your church and your ministry! Many pastors that I visit with say they would really like to have a revival meeting with an evangelist. Some explain they simply couldn't afford to invite an evangelist, while others say they were told evangelists would hurt their work and steal the tithe. Still others believed that an effective Evangelist would not come if the church was small and could not guarantee large crowds and offerings. There was also concern because small or new churches did not have their own buildings. A few even suggested they did not need a revival among their people. I am disturbed by these reactions. My concern is not centered around pastors and churches who prefer to use other pastors for revival meetings or even not to have revival meetings at all. After all, that is their right and privilege. They know t he needs of their people better than anyone else. pastors, here are some facts you might want to consider. First there is no church that does not need a revival. Sin, worldliness, indifference, coldness in the heart, lost of first love, lack of vision, lust, immorality, and a host of other things plague Christians today. Our homes are torn and our churches are split because of sin hidden in the hearts of Christians. God's people need to turn from sin and seek the face of the Lord. Every church needs a revival of some sort. 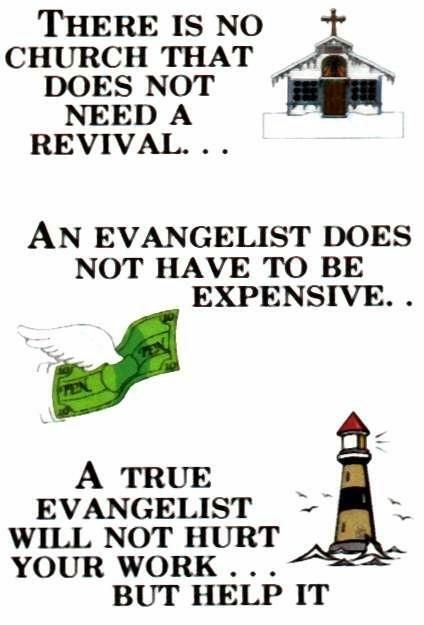 Secondly, having an evangelist does not have to be expensive. Not all evangelists charge for travel or expenses. I personally know of none that have a set or minimum fee for a meeting. Also, not all evangelists sell things in the church to supplement their offerings. There are still good evangelists that do not mind staying in homes instead of expensive motels if the church can not afford one reasonably. A great deal of expense is eliminated by seeking an evangelist who does not have a big overhead of living and travel expenses or preferences. Thirdly, a true evangelist will not hurt your work but help it! He will be more interested in seeing souls saved and Christians revived then building his mailing list and selling his recordings and books. He will seek to exalt Christ and not himself and will not touch the Lord's tithe. Thank God America still has some old fashioned preaching evangelists who know and live by God's plan. Finally, almost anyone, including small and poor churches, can have an evangelist for revival meetings. Many evangelists today do not consider the size or wealth of a church before accepting an invitation to come. I am telling you all this for two reasons. you can find one that will meet your needs. Number two: Today there are a variety of alternatives available in the work of the Lord; your choices range from gospel films to drama teams, to musical groups and many more.  While these are attractive, you should remember that God's has set in order in the church ". . . Evangelists, Pastors and Teachers." Please don't forget to use evangelists in your ministry. I believe every church deserves the time and attention necessary to achieve a lasting revival long after the meetings are over. I have written all this because I believe it is my responsibility to do all in the name of the Lord, to build His church and uplift the man He has called as Pastor. Thank you for you time and attention. May the Lord's best blessing be yours.